​Legacies matter, because the past protrudes into the present and shapes the future (Simmel). In contemporary Ireland, legacies of state and church interventions resurfaced with revelations around the Magdalene Laundries. The role of institutions in shaping public moralities is obvious in debates surrounding Repeal the 8th and the ongoing Brexit crisis has highlighted legacies of religious, political and ethnic divides and a need to revisit notions of our Republic. These issues highlight the need for strong sociological responses to the past in order to better understand and shape the future. The ongoing process of individuation is thought to lead to the fading of individual and collective memory and to a growth in political apathy. Lacking memory, losing hold of our legacies, persons and societies suffer from amnesia, and become prone to manipulation by ‘alternative facts’ and ‘fake news’. 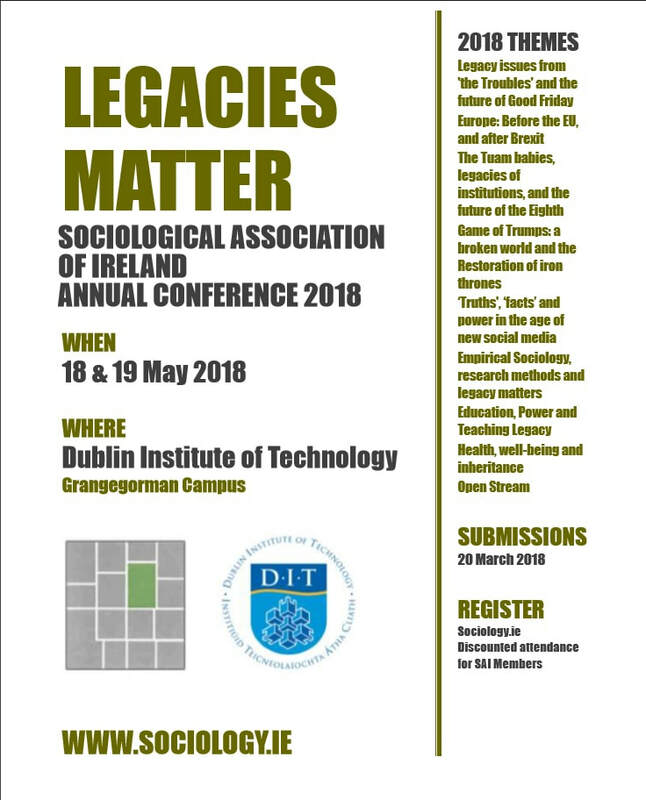 The conference this year invites papers on this topic by posing urgent social, cultural and ethical-political questions: What is forgotten, what we ought to remember, and what we may need to forget. If we are to envision a future other than Brexiteer atavism, Trumpian apocalyptic carnival, and planetary climate breakdown then reflection on our legacies really matters. The Dublin Institute of Technology Grangegorman campus offers the perfect place to explore these legacies. We welcome any area of sociological research, and particularly encourage research communities to offer panels of interest to highlight and build academic networks. Dublin Institute of Technology and the School of Languages, Law and Social Sciences is delighted to be hosting the SAI Conference 2018 at our new Grangegorman Campus. The campus will unite all DIT schools and colleges that are currently dispersed throughout the city. Sociology is as important now as it always has in providing us with critical concepts and empirical work to help us understand and to actively engage with the issues and challenges that we face in Irish society today. We welcome this opportunity to bring sociologists from Ireland and abroad to Grangegorman. The campus has in the past served many purposes as a prison, mental hospital, a women’s penitentiary and a hospital for treating shell-shocked soldiers. We are excited to make a new history for this place: once an island in Ireland’s carceral archipelago it is now part of an exciting new project to be one of Ireland’s leading third level institutions. We are proud especially of our tradition in the social sciences in our teaching of professionals working in education, social care but also in our highly-regarded teaching and research in areas such as criminology, media and the creative arts. ​We encourage you to visit the city and the neighbourhoods close to the campus (Smithfield, Phibsborough and Stoneybatter): our Luas stop at Grangegorman can act as your conveyance further afield to the city centre, St. Stephen’s Green and beyond. 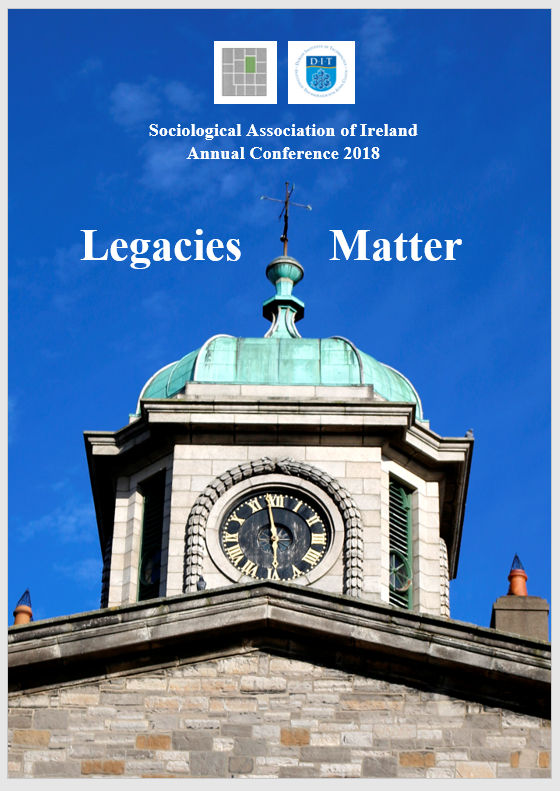 We are delighted to be associated with the SAI over the years and we hope that the 2018 Annual Conference at Grangegorman will build upon recent events at Ulster University in Belfast and at the University of Limerick. ​While we are open to papers on a range of subjects to facilitate debate between sociologists from all fields, we are particularly interested in receiving proposals in relation to the following themes. Individual papers, panels, roundtables and other formats are invited. Sessions will be thematically organised in the programme. There will also be an open stream, from which additional thematic panels will be organized, so please put submit research in additional areas. Panel submissions may be on any theme. · Roundtables and Masterclass events on any topic - please submit a single abstract with details of participants. · Panels on any topic may also be submitted – please include participant names and abstracts for each paper, with a nominated panel coordinator. · We are also happy to consider innovative formats for presentation which best showcase your research. Please include a description of the format with your submission. A member of the selection panel will contact you to discuss the format. Early queries are welcomed.